Figure 2. Cercospora leaf mold symptoms on the upper leaf surface. Note distinct chlorotic lesions. Photo by Dan Egel. 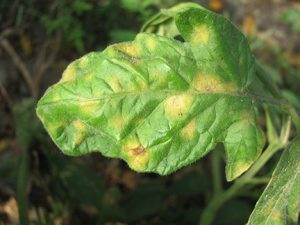 This disease does not typically affect Indiana tomatoes, instead preferring tomatoes grown in tropical and sub-tropical areas. 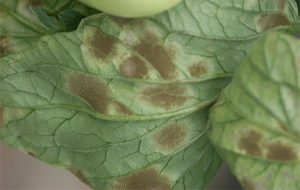 Since Cercospora leaf mold was observed in two different areas of Indiana in the 2015 season, it makes sense for growers to become aware of this disease in case it returns to Indiana in 2016. The two locations where Cercospora leaf mold was observed in Indiana in 2015 were 1) a homeowner garden in southern Indiana and 2) a high tunnel in central Indiana. 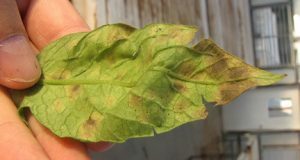 The fungus that causes Cercospora leaf mold, Pseudocercospora fuligena, normally does not overwinter outside of tropical and subtropical areas. It may be that a wind blew the fungus in from the south in 2015. Symptoms of Cercospora leaf mold are similar to leaf mold caused by Passalora fulva. Both diseases cause chlorotic (yellow) lesions which are visible on the upper side of the leaf. 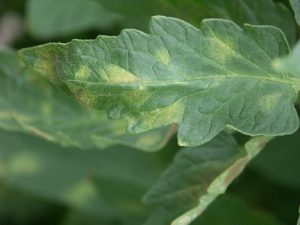 The chlorotic area caused by Cercospora leaf mold is more of a mustard yellow than that caused by P. fulva leaf mold in which the lesions are more diffuse and a brighter yellow (Figures 1 and 3). On the underside of the leaf, P. fulva leaf mold causes an olive-green fuzz that is from the causal fungus growing on the leaf. Cercospora leaf mold can be differentiated from P. fulva leaf mold because the former is caused by a black fungus that grows primarily on the underside of the leaf (Figures 2 and 4). Neither disease causes lesions on stems or fruit. The causal pathogen of leaf mold, P. fulva, will overwinter as crop debris in the soil. This disease is often observed in high tunnels where high humidity and crops of tomato after tomato favors the disease. Cercospora leaf mold will hopefully die out this winter in our cold climate. Both diseases may be managed by sanitation. Clean out high tunnel tomatoes between crops. A floor covering that prevents infected leaves from entering the soil will help lessen disease severity. In the field, practice crop rotation and till under the crop as soon as the last fruit is picked. Fungicides which control P. fulva leaf mold should help to lessen disease severity in Cercospora leaf mold. The Midwest Vegetable Production Guide for Commercial Growers 2016 (coming January 2016) will help growers to choose a fungicide for P. fulva leaf mold. Always be sure to choose a fungicide labeled for greenhouse use if necessary. And always read the label. Figure 3. Underside of tomato leaf with Cercospora leaf mold. Note dark fungal growth. Figure 4. Lesions of leaf mold caused by P. fulva on tomato. Note indistinct chlorosis. Figure 5. Underside of leaf with symptoms of leaf mold caused by P. fulva. Note olive-green fuzz of fungal growth. Photo by Dan Egel.